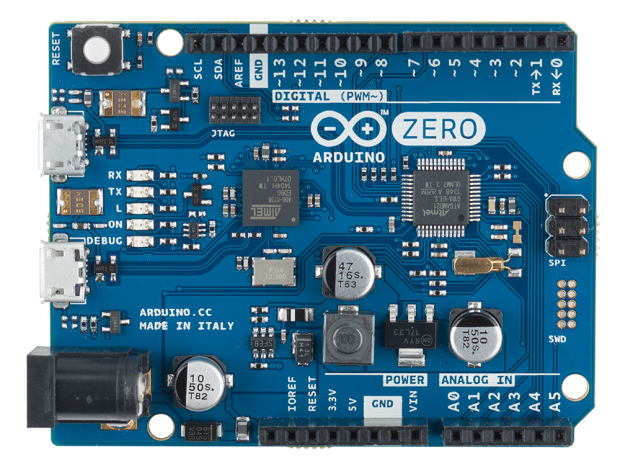 Hinted at yesterday by Massimo Banzi during his keynote speech at MakerCon yesterday, Arduino has just officially announced their latest board—the Arduino Zero. 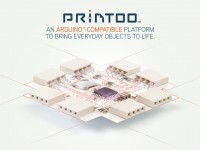 While it shares the same form factor as the Arduino Leonardo—with 14 digital and 5 analog pins—all of the digital pins except the Rx/Tx pins can act as PWM pins, and the analog pins have a 12-bit ADC instead of the Leonardo’s 10-bit ADC, giving significantly better analog resolution. The new board comes with 256KB of Flash memory, and 32KB of SRAM. In comparison the 8-bit Leonardo which uses the Atmel ATmega32u4 comes with just 32KB of Flash memory and 2.5KB of SRAM. While the new board doesn’t have EEPROM, it does support 16KB by emulation, so Arduino sketches relying on this feature will still run without issue. Like the Arduino Due, the first Arduino micro-controller to be based on an ARM core, the new Zero runs at 3.3V while there is a 5V power pin on the board in the usual place, it looks like the voltage of the rest of the digital and analog pins is 3.3V rather than the normal 5V—so any shields you use with the board will have to be 3.3V compatible. One of the interesting differences about board layout of the Zero is the addition of an extra micro-USB port. While information is pretty thin on the ground at the moment, the SAMD21 supports both USB Host and Device mode, so it’s possible that that extra port is to support that functionality. Although its also possible that this USB port could be dedicated to support Atmel’s Embedded Debugger (EDBG) as this is the first Arduino board to support this feature. EDBG is an interesting addition—it provides as it provides a full debug interface without the need for additional hardware. The first prototypes of the new board will be on display at the Arduino (#204), Atmel (#205) and ARM (#405) booths at Maker Faire Bay Area, which kicks off in just two days time. So see you at the faire, the greatest show (and tell) on Earth!